If you’d said the words ‘high-fat diet’ to any health and fitness professional twenty years ago, they would have backed away, holding their fingers in front of them in the sign of the cross. Some of them might have been intrigued, but most would have been horrified. “Eat a high-fat diet AND lose weight? How dumb is that.” And it made sense at the time. Fat in food was thought of in a literal way – eat fat, get fat, right? Meanwhile, keep tucking into numerous rice cakes spread with 0 percent fat soft cheese. Yum. Fast forward to 2017 and there will be few people in health and fitness who haven’t heard of the Ketogenic diet – sometimes referred to as the low-carb, high-fat (LCHF) diet. Originally developed for epileptic children in the 1920s, this eating regime has grown vastly in popularity in recent years. 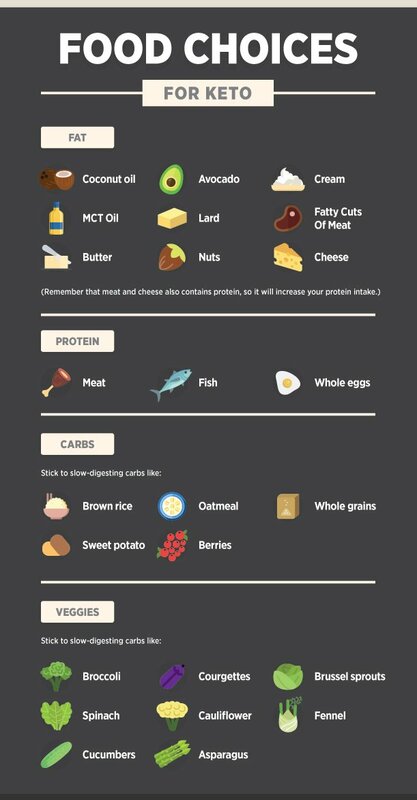 Simply put, a ketogenic diet promotes a very low carbohydrate intake, moderate protein and the bulk of the calories come from fat – butter, coconut oil, nuts, avocados, fatty meats and fish, cream, cheese and others. Most people will be familiar with the use of Keto diets for weight loss, but can you use it as a bodybuilder? Will you be able to build muscle at the same time as eating your fill of chicken thighs in creamy mushroom sauces and the like? First off, what are the rules of Keto dieting? Think of the first phase of the Atkins diet, where the total recommended carbohydrate intake for the day is less than 20g. Recommendations for carb intake on a Keto diet vary – from sub 20g to about 60g. The aim of the diet is to switch the body from burning carbohydrates for fuel to using its fat stores. When you eat carbs, your blood sugar levels rise. Your body releases the hormone insulin to get the glucose inside your cells. Insulin will prevent fat from leaving the cells, so high amounts of insulin in your body will make you store fat. 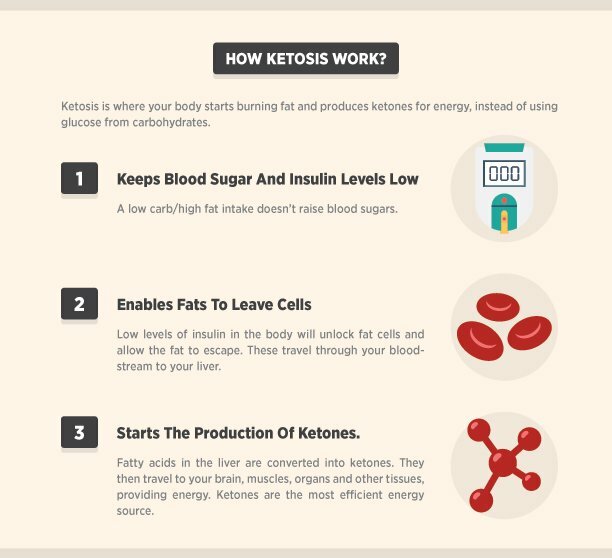 Ketosis is where your body starts burning fat and produces ketones for energy, instead of using glucose. Keeps blood sugar and insulin levels low. A low carb/high fat intake doesn’t raise blood sugars, and very insulin is needed. Enables fats to leave cells. Low levels of insulin in the body will unlock fat cells and allow the fat to escape (fatty acids). These travel through your bloodstream to your liver. Starts the production of ketones. Fatty acids in the liver are converted into ketones. They then travel to your brain, muscles, organs and other tissues, providing energy. Ketones are the most efficient energy source – they produce more energy per gram than anything else. Keto dieting for bodybuilding consists of low-carb days with carb refueling – usually one day a week. This allows your body to replenish its glycogen stores – glycogen is basically sugar stores in the muscles. It also gives you a break from dieting and means you can catch up with your family and friends without feeling like the weirdo in the corner who has brought his own food! The Ketogenic diet for bodybuilders begins with a one-week Keto phase – so 6 days of Keto dieting and 1 day of carb refueling. A ‘typical’ bodybuilding diet will include carbs in the form of fruit, vegetables, white rice, potatoes and pre-workout/post workout shakes. In a Keto diet, the carbs come mainly from vegetables. Most fruit is too high in carbs to fit into the plan – a banana, for example, can be as high as 30g of carbohydrates. Vegetable choices on a keto diet focus on grown-above-the-ground veggies, such as salad leaves, spinach, kale, cucumbers, courgettes, peppers, broccoli, and cauliflower. If you want to be very serious about it, you can use Ketone sticks to check if you are in ketosis. The sticks are available on Amazon and in pharmacies, and you pee on them. They cost roughly $9 for 50 sticks. Keto blood testing is more accurate – but much more expensive too. Athletes and bodybuilders should aim for the higher number – so that the protein intake will equal about 20 percent of total calorie intake. For Keto days, your calorie intake should be your body weight in pounds time 15 if you are a man and 13 if you are a woman. For a man who weighs 190lbs – the calorie intake is 2,850. For a woman weighing 126lbs, the calorie intake is 1,638. 2,850 calories, made up of 75 percent fat (237g), 20 percent protein (142g) and 5 percent carbs (35g). 1,638 calories, made up of 75 percent fat (136g), 20 percent protein (82g) and 5 percent carbs (20g). Coffee with double (heavy) cream for breakfast. Instead of cream, you could put butter or MCT oil into your coffee. This is sometimes referred to as ‘bulletproof coffee’. Eggs scrambled with butter is another choice. Salad leaves with an olive oil dressing, and roasted chicken thighs. Leave the skin on and add some chopped Macadamia nuts for texture. Home-made burgers topped with blue cheese and more salad leaves dressed with mayonnaise. Keto cookies (made from almond flour, coconut flour, artificial sweetener and sugar-free chocolate). This adds up to about 20g total carbs, minus roughly 4g in fiber so 16g net carbs. The fiber in foods doesn’t affect blood sugar levels, so most people counting carbohydrates will discount it from their totals. You might find you are less hungry on a Ketogenic diet. This is because your blood sugar levels will stable out. Protein and fat are very satiating as well. If you want to follow the diet correctly, you will probably need to track your intake of food as 20-60g of carbs is not very much and they can stack up quickly. What happens to Adam and Eve on the carb-loading phase? Man – 2,850 calories, made up of 20 percent protein (142g), 350g of carbs (about 50 percent) and 30 percent fat – sub 80g. Woman – 1,638 calories, made up of 20 percent protein (82g), 240g of carbs (about 60 percent) and less than 75g of fat (40 percent). After that, it’s back to six days of Keto and then one day of carb refueling. What do you eat on a carb refuel day? Do you go mad on pizzas, doughnuts, and ice-cream? Actually, it’s a bit tricky. If you have ever read the nutritional information on a pizza box, you’ll know that pizza is loaded with carbs AND fat. Eat the whole lot, and you might well go over your calorie intake for the day. Better choices are slow-acting carbohydrates – i.e. unrefined carbs that do not go into your bloodstream so quickly. Choose sweet potatoes, brown rice, pulses, whole grains such as barley and quinoa and get your sweet fix from fruit. Alternatively, if you do want to splash out, why not eat keto for the day and then have a splurge meal. Eat your burger and chips and wash it down with full-sugar Coke. Just as long as the total amount doesn’t exceed your calorie and macro goals for the day. Carbs: above-the-ground-grown vegetables, such as salad leaves, cucumbers, peppers, courgettes cauliflower, spinach, broccoli, and cauliflower. Small amounts of berries, such as raspberries, strawberries and blueberries, and limited numbers of tomatoes. Drinks: water, unsweetened tea or coffee without milk, herbal teas, green tea, pre-workouts and post-workout shakes that have no carbs. 1.Is the Keto diet for everyone? No. Some people will find it exhausts them – although others report that if they stick with it, the exhaustion wears off after a while. But some people do better burning carbohydrates for energy. 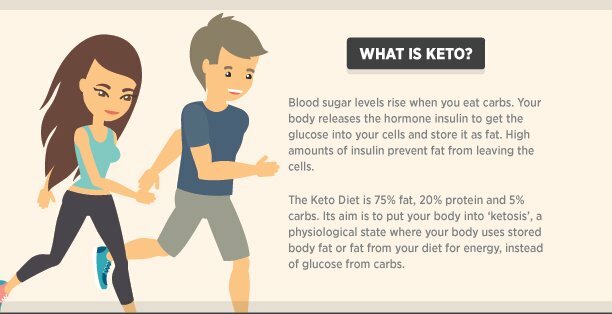 Type 1 diabetics should follow a Ketogenic diet under the supervision of a medical professional. Because the diet is so low in carbohydrates, it can result in dangerously low blood sugars (hypos) if insulin dosages aren’t adjusted at the same time. It is also dangerous for diabetics to experience very high levels of ketones and blood glucose levels at the same time, as this will cause ketoacidosis – a different condition to ketosis. Vegetarians can follow the diet, although it will be tricky. Vegans will find it almost impossible, as a low-carb diet without any animal products will not contain enough food or calories. 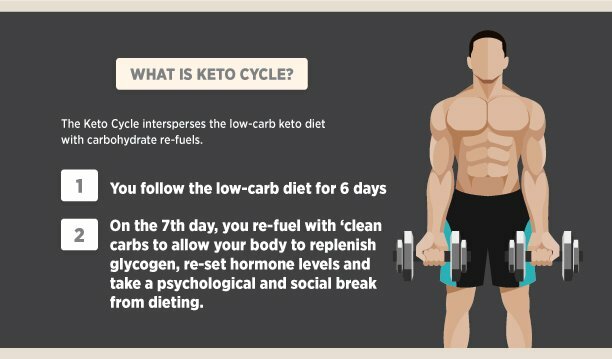 2.Are there any side effects of Keto cycle diet? Headaches. Make sure you drink plenty of water during the first few days of a Ketogenic diet. You can also drink bone broth (i.e. stock made from animal bones flavored with salt) to help keep you hydrated and counter the salt deficiency that can be caused by increased urine production when you start a Ketogenic diet. Constipation. Carbs contain fiber so reducing them drastically might give you constipation. You can get around this by making sure you eat plenty of fiber-rich vegetables on your keto days, such as broccoli, spinach, and Brussel sprouts, take a magnesium supplement or a fiber supplement such as psyllium husks. Ensure you drink plenty of water too. Coconut or MCT oil. You know how we’ve just talked about constipation being a problem? For some people, coconut or MCT oil can have the opposite effect… Gulp down tablespoons of the stuff on a virgin stomach, and you might find yourself on the toilet for a considerable time. 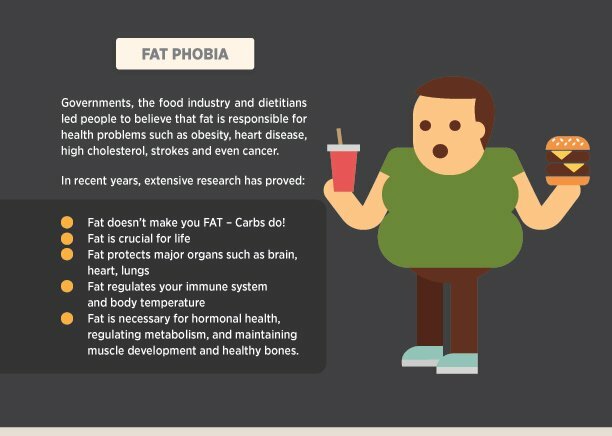 3.FATPHOBIA – Should I be scared of all this saturated fat? We don’t blame you for being scared. For years, it’s been hammered into us that saturated fats are the devil incarnate, and they’ve been blamed for causing heart disease. Plenty of health websites and official organizations will still advise people to reduce their saturated fat intake. A Ketogenic diet, on the other hand, can contain a lot of saturated fat thanks to full-fat dairy products, meat, butter, and lard. A 2014 research project that looked into 72 different studies on fats and heart disease challenged the long-held assumption on the role of saturated fat in heart disease. Saturated fat, it was found had no effect on heart disease. The British Heart Foundation helped fund that study, but they believe more research is needed before they can give saturated fat the all-clear. Health experts such as Dr. Jason Fung, Gary Taubes, Dr. Andreas Eenfeldt and Dr. Aseem Malhotra do not believe saturated fats are a risk to our health – only when they are combined with sugars and starches in pastries, cakes, biscuits, and pizzas. Remember – you should consult your doctor before embarking on a Ketogenic diet. Good luck with your efforts and do not forget to track your progress. You might want to show everyone your before and after pictures!